In today's world, businesses must stay up to date with cloud technology to stay agile and remain competitive. The reality of technology is often different than what is popularly portrayed: in the vast majority of cases, there are tangible advantages and disadvantages associated with any new innovation, and businesses are forced to make necessary compromises as a result. The benefits of and the drawbacks of cloud-based technology will vary from business to business: some companies will be better equipped to deal with downtime than others; some relatively stable businesses won’t be too bothered by the prospect of instant upscaling. Knowing how this technology can work for your business can be particularly difficult. So how can cloud-based software meaningfully affect your operations? It’s important to note upfront that cloud-based software is not a cure-all for your business’ various IT ills. It’s an imperfect and ever-changing area, and if integrating new workflows and processes is necessary, it’s seldom completely smooth and easy. Data security issues, for example, have been a commonly-cited problem: if devices are compromised, the attacker will have access to everything stored on the cloud. Complicated passwords and restrictions on certain accounts or devices may be necessary. These risks have been somewhat overstated however, and if you use a trusted, mainstream provider and take care with all relevant data you ought to be fine. Issues with outages should also be somewhat rare, though it’s always important to have backups in place when they do occur. Nonetheless, the cloud’s upsides considerably outweigh its demerits. There are providers out there who can drive operational efficiency, keep data safe (and accessible), and lighten your administrative and IT burden. It is worth taking the time to find them. The most immediately obvious advantage of cloud computing is perhaps its level of technical innovation. It’s high-speed, it’s accessible from anywhere, and it allows you to simplify complex processes that might otherwise require extensive investment and manpower. If you want to collaborate on a new project, and if you want to do it quickly, cloud technology can help. 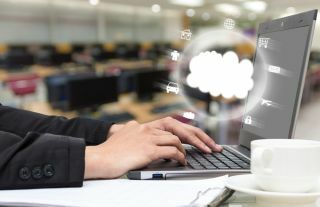 And while security issues are commonly cited by sceptics, it’s important to understand that cloud computing can play an important role in safeguarding your business and its data. When your information is tied to physical storage on a laptop or server, you’re at the mercy of your laptop or server. You have to either operate on the assumption that they won’t get lost or fall into some state of irretrievable disrepair and spend money on expensive – and space-occupying – backups. Cloud technology means your data is accessible by whoever needs it regardless of what happens to your physical machines. Better still, this functionality extends to your laptops and servers: a ‘remote wipe’ capability can ensure that your sensitive information never falls into the wrong hands. As ever with issues of security, it’s no substitute for proper safeguarding and protocol – but in some respects, you’re safer with cloud technology than without. The advantages of eschewing traditional storage and infrastructure go beyond security, of course. If you’re growing quickly and unpredictably, it very much beats using physical servers. With cloud computing, you can upscale your capacity to meet your evolving requirements – and often without having to purchase more than you strictly need. If you need to downscale suddenly, this is also often possible. But while this benefit may be obvious, the cloud’s most important functions lie beyond any raw technological power or innovation. There’s no getting around the fact that, for many businesses, IT is as much of a daily nuisance as an enabler: running and maintaining your own infrastructure drains time, money, and attention away from other commercially and operationally important tasks. A managed cloud solution will take care of all that for you: freeing up time to focus on the things that really matter. And while cloud technology is certainly useful, we shouldn’t neglect that it’s also – in some respects – socially responsible. It isn’t necessarily designed for this, but the ability to upscale and downscale your server capacity means you’re never using more energy than you strictly need to. With cloud technology, you only leave a substantial carbon footprint if you’re doing so on purpose. Cloud technology empowers the willing business to completely get rid of servers and physical data centres if they so desire, and the ease in which users can share information means fewer printouts and less wasted paper. Green initiatives are also a handy way to boost and maintain your business’ reputation: courting your target audience is a lot easier if you’re believed to be a positive and progressive force within your industry. It’s essential to also mention that cloud computing – for good or ill – is being developed, iterated, and improved upon to such an extent that investing and implementing it within your own business is simply good future-proofing. The technology is useful to the point where it reduces the capability gap between small businesses and massive international corporations: the difference between a large company using sales-i and a small company using sales-i is often a matter of size. In fact, smaller companies may have a distinct advantage over their monolithic competitors: they’re faster, leaner, and able to capitalise on any new developments more rapidly than their bigger competitors. In this regard, cloud technology may well be the great equaliser. No longer will the quality of a system be determined by the depth of a business’ pockets: organisations with more intricate hierarchies can’t make decisions very quickly; they operate across international borders and have to factor multiple legal systems into any implementation; and they also have more legacy systems to consider. You know what they say: the bigger they are, the harder they find it to quickly deploy new technologies. Accordingly, enterprise-level technology isn’t just for enterprises anymore – and if you still aren’t employing some form of cloud-based technology, your business may well be left behind. To stay agile and ahead of the curve in 2018, you have to stay up to date with cloud technology – in all of its various forms.